Delicious Keto Hazelnut Low Carb Cheesecake Bites To Try Right Now! 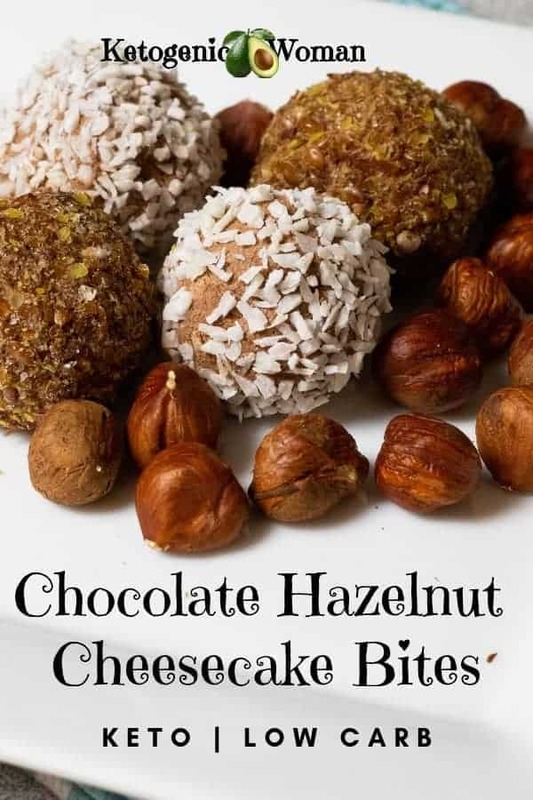 So I was browsing on Pinterest trying to find some snacky sweet Keto recipes for those times the sweet craving hits and I came across some very tasty chocolate coconut balls. That gave me the idea for these Hazelnut Low Carb Cheesecake Bites. They fit the high fat, low carb, moderate protein ratio for Keto very nicely and taste amazing! Be sure to let the cream cheese soften up to save your arm, I was too impatient the first time! 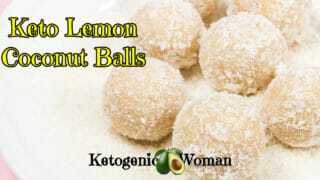 I’m so glad I tried it, this is one of my favorite hazelnut keto friendly recipes! They taste like a delicious keto cheesecake, but they are bite size. I’m lucky in that I live in an area where Hazelnut trees are practically a weed! My Dad even has 3 trees in his backyard so I get buckets of hazelnuts every year. If your supermarket doesn’t have them, the best prices are on Amazon! Hazelnuts (also called Filberts by the way) are a staple around here because they make such a quick healthy snack. Here’s a great article I found about the health benefits of hazelnuts. The kids like to crack them open so I can usually get them busy on this and keep my supply well stocked. I keep all my open hazelnuts in a bag in the freezer. They are a great snack for a low carb diet. Ground hazelnuts can also be used as a crunchy coating for chicken breasts and also you can mix them with butter to make a low carb crust when making a pie or for my recipe for this low carb cheesecake! Of course my kids just eat them out of the shell like nature’s candy! So they naturally love when I make hazelnut keto desserts like this keto chocolate cheesecake favorite. Put out the cream cheese to soften on the counter at room temperature. Once softened, place in a large bowl and add all other ingredients except for the ground hazelnuts. Use a wooden spoon to blend the cream cheese, cocoa powder, So Nourished erythritol and syrup. (NOTE) I find the syrup to be sweet enough so I don’t always add sweetener, but you can after you taste it. Roll the mixture into 16 balls. Dip each ball into the ground hazelnuts or unsweetened coconut. Chill to harden. I keep mine buried in the back of the fridge (so my kids don’t eat them all at once!). Then they are there for me when that emergency craving hits! Update: It’s July and we are in a heat wave. I tried making these tonight and the mixture was too soft to roll into balls! 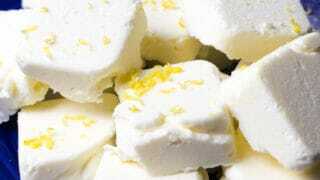 To make them less soft use less syrup (only 1 tbsp) and maybe add some extra sweetener instead. What I ended up doing (because I had already added too much syrup!) is spreading the cream mixture in a silicone pan and sprinkling the ground hazelnuts on top. Then I placed in the freezer for an hour. Cut into squares. This was quite heavenly actually! 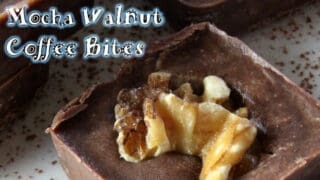 Delicious Low Carb Keto Sugar free Hazelnut Cheesecake Bites are a super easy treat! Use a wooden spoon to blend the cream cheese, cocoa powder, sweetener and syrup. Roll the mixture into 16 balls. Dip each ball into the ground hazelnuts. Nutritional information for the recipe is provided as a courtesy and is approximate only. We cannot guarantee the accuracy of the nutritional information given for any recipe on this site. Erythritol carbs are not included in carb counts as it has been shown not to impact blood sugar. © © Copyright Anita Breeze for Ketogenic Woman. We'd LOVE for you to share a link to this recipe, but please DO NOT COPY/PASTE the recipe instructions to social media or websites. You may share a photo with a link back instead. Pin these Keto Hazelnut Cheesecake Bites! I hope you enjoy this keto cheesecake dessert! We sure do! More Low carb and keto fat bombs! Tagged cheesecake fat bomb, easy low carb cheesecake recipe, fat bombs, low carb cheesecake bites. Bookmark the permalink. 65 Responses to Delicious Keto Hazelnut Low Carb Cheesecake Bites To Try Right Now! Any way to substitute Nutella in this recipe ? Actually, I’m a macadamia nut lover (hazelnuts are good, too), so I was thinking of trying those. This recipe looks amazing! I would make one suggestion, which would be to leave off the Sugar Free Hazelnut Syrup in favor of using Hazelnut Flavored Stevia Drops. The Sugar Free Syrup is loaded with harmful chemicals, so if you really want to get harmful processed foods out of your diet, then the sugar free syrup has to go too. I know it tastes yummy, but it’s really bad news. The Hazelnut Stevia is delicious and doesn’t harm your body. Thanks for the suggestion! I will take a look for that because these days I am really cleaning things up in my eating. For the woman with the milk allergy, I had a coworker that made cheesecake with soft tofu. For those who can’t do soy, there’s a trend in Paleo of making cheese substitutes out of cashews. I think I’ve run across recipes for cream cheese made that way. You might have a slightly different carb count but it shouldn’t break the bank. Many years ago I actually did make cheese out of cashews! It was pretty good but I never did it again, just too much work! Just made these in place of my rraditional rum balls for Christmas! Omitted sweetener and syrup, mixed through some chopped macadamias and vanilla powder and a large splash of brandy, and rolled them in cacao nibs instead of the hazelnuts. Just awesome! 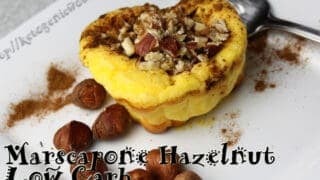 Can I substitute the hazelnuts with other nuts like macadamias or almonds as I’m allergic to hazelnuts and if I can’t find the syrup could I just use the stevia instead? Oh for sure, these can be totally customized like that! 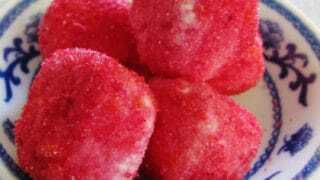 Cream cheese balls can be made a hundred different ways depending on whay you like and what you have on hand. Can these be made with Hazelnut meal? Yes, I believe it would be the same thing as ground hazelnuts. Might be a little finer, but basically the same. Thanks for stopping by! Got suggestions for the milk allergy folks? How do you replace the cream cheese? Hmmm, no I’m sorry I don’t have any experience with milk allergies. Maybe someone out there will see this and chime in. Thanks for stopping by! How are these low carb and moderate protein when the net carbs are equal to the amount of protein? The math doesn’t add up to the claim. I guess you are technically correct on the wording. The bites themselves are not moderate protein, but these are perfect for keto because they are so high in fat. One of the issues that I have is that I get to the end of the day and I have used up most of my carbs and protein but am way too low on my fat. So these are perfect to get my ratios in line. That’s exactly how I found your site! I have the same issue. I just Googled for “keto cream cheese recipes” and here I am. Either way, thank you for sharing! Do these really firm up? Mine have been in the fridge a couple of hours and are still pretty soft. Yes, as long as you used the firm brick type cream cheese and not the spreadable type. And not low fat, of course! I hope they firm up for you! Sounds like a tasty recipe! I love hazelnut!! These sure looks tasty. Got to try this at home. Thanks for sharing your recipe. Your welcome! 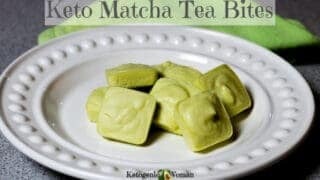 Hope you try this Keto dessert! That’s why I keep them in the back of the fridge! They are emergency snacks! Yes, and they taste that way as well! I love the calorie count!!!! YUM! Going to use your recipe this weekend!!! This is so new to me! Thanks for introducing this loveliness to me! You are so welcome! They are indeed lovely! Wow look fabulous. You post some great recipes. Thank you so much! Aw, thanks Irene! I’m secretly a wannabe food blogger! Seem easy to make and really good for you too. Can’t wait to try them. Super easy and I love them! 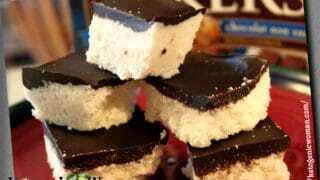 Great recipe for the upcoming holidays to take to parties and as the wife says for “cookie exchange parties”. Yes, these will be popular with the low carb crowd who cannot eat the regular cookies! Recipe sounds easy, and they look really good.. It is and they are! They look delicious! I have been addicted to Pinterest the past month..
Pinterest is my playground! LOL! I would love to see more ketogenic dessert recipes. I often follow a low carb diet. I saw on the navigation that you have a lot of recipes. I hope your weight loss journey has been successful! I am definitely on a mission to bring more recipes like this to this site! Sounds delicious. Wonder if I can use my hazelnut flavoring and another form of sweetener, ie. stevia, coconut crystals. I am certain that you can do that! Thanks for asking this. I am wondering the same thing. Prefer to use Stevia sweetenend stuff than Splenda. Yum! Yum! Yum!.. I am def going to save this.. Looks so good!.. I am sure my family would enjoy these..
What’s not to like about hazelnuts and chocolate! This looks good. I will be trying this out! These snacks sound yummy. I’m going to look into Keto as I’m not sure what this is. 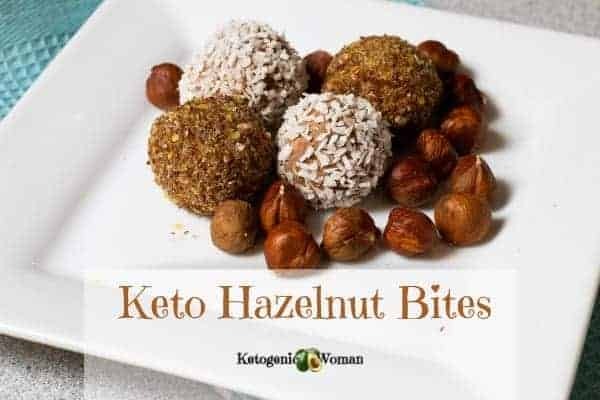 In any case the Ketogenic Hazelnut Cheesecake Bites are on my radar and shopping list. There is info on this website about what Keto is. Hope you enjoy the cheesecake bites! I love hazelnuts and this looks like an easy and tasty recipe we will have try. Yes, I grew up with hazelnuts growing in my backyard. I do love them! I make Italian cheese cake with Stevia as well. Oh I bet that is good! I like the little bits for portion control. My husband loves cheesecake…I wonder if he would like these! Thanks for sharing this recipe! Well, its ‘pretend’ cheesecake for me as I am not eating sugar on this Keto plan!